A first birthday Cake Smash is a very popular way to celebrate your baby's first year. Watch your little one having fun exploring new tastes and textures while demolishing a huge birthday cake, which results in stunning, fun and cute photographs that truly capture their personality. 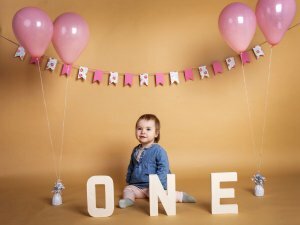 We are recognised as one of the best newborn specialist photographers in the north east. With over 10 years’ experience in photographing newborns you are definitely in safe hands with us. Steven & Paul have been awarded Licentiateship of the Master Photographers Association (LMPA) for the high quality of their work. Our personal guarantee that you will be delighted with the final images at your viewing or we’ll refund the cost of your session/voucher. What is included in a Cake Smash experience? Up to 1hr in our modern and cosy photography studio with a fully qualified Master Photographer. Creative image editing – The best images from you shoot will be creatively edited ready for your private viewing (for in-house viewing only). A private cinema style viewing – Preview and design your Wall Art images in our cinematic studio about a week after your shoot. 100% money back guarantee – Our personal guarantee that you will be delighted at your viewing or we’ll refund the cost of your session.